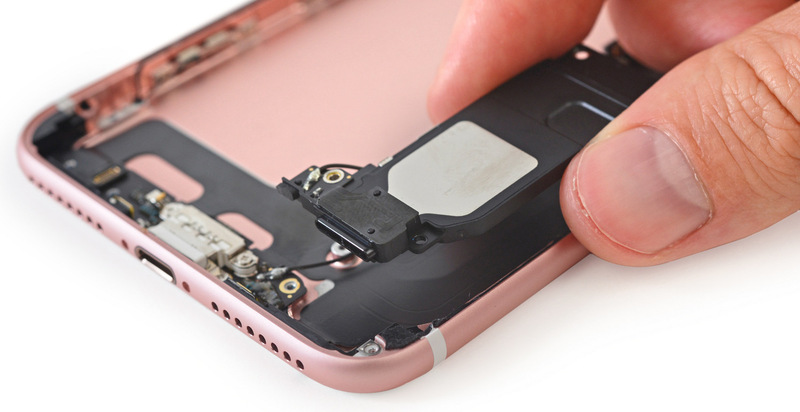 Repair wizards over at iFixit flew out to Japan to obtain their iPhone 7 Plus (in Rose Gold), performing their ritual teardown dance which has helped confirm what we’ve been suspecting all along: that a second grille at the bottom doesn’t house a second speaker. 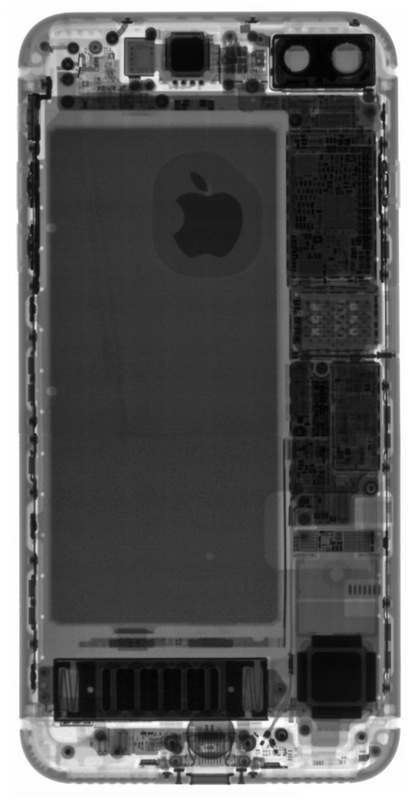 Other interesting observations gleaned from peeking under the hood of the iPhone 7 Plus include a replaceable Home button, a lot bigger Taptic Engine than in the iPhone 6s, a bigger 2,900 mAh battery, dust and water-proofing measures and other tidbits. 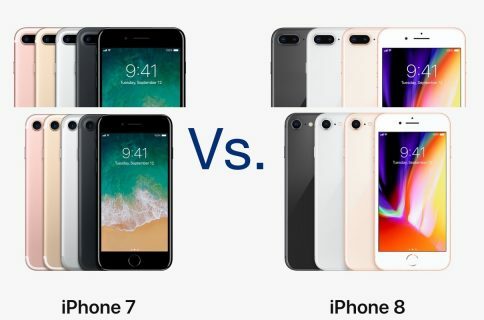 The dimensions of the new handsets are unchanged from their predecessor, but the iPhone 7 Plus is slightly lighter at 6.63 ounces (188 grams) versus the iPhone 6s Plus at 6.77 ounces (192 grams). The iPhone 7 Plus also has a new model number “A1785”. Looking at the phone with X-ray vision (bottom image) shows that the removed 3.5mm headphone jack has created more space for a bigger Taptic Engine versus the iPhone 6s (image top of post). 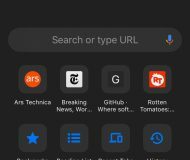 The Taptic Engine, of course, is Apple’s marketing name for zig-zag springs that shake a weight. The two microphones at the bottom are firmly adhered to the speaker grilles but that faux speaker port in lieu of the headphone jack is simply there for visual symmetry (the 2x louder earpiece at the top + the bottom speaker = stereo sound). 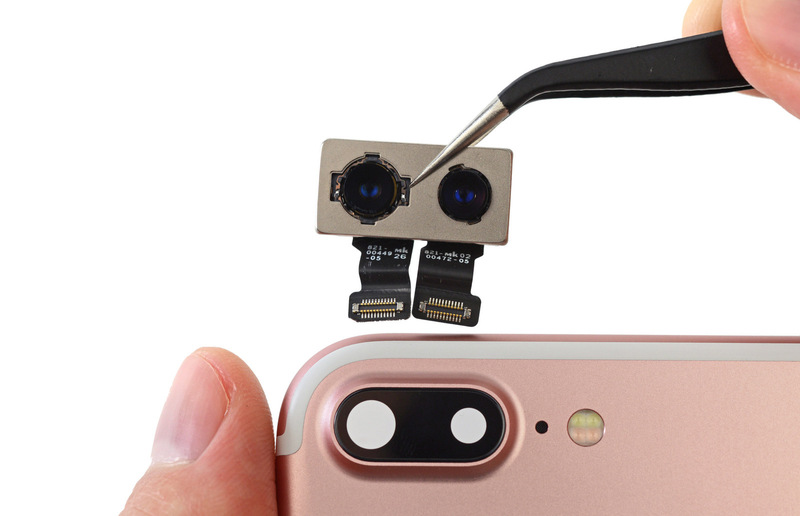 “In place of the headphone jack, we find a component that seems to channel sound from outside the phone into the microphone, or from the Taptic Engine out,” notes iFixit. Interestingly enough, the display of this year’s iPhone opens to the side like a book versus prior iPhones that flipped up like steno pad. Luckily, there’s no adhesive on the LCD shield plate. You’ll still find the familiar clips at the top of the device that help align the display as in previous models. 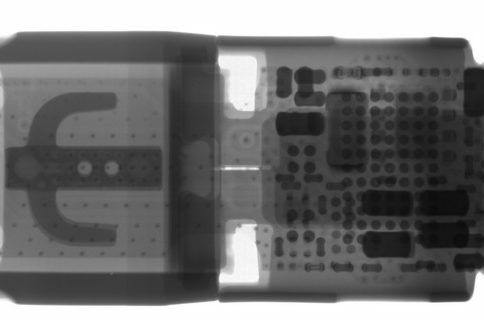 In terms of creating the first dust and water-resistance iPhone, Apple has had to change the internal layout, move around cabling and other connectors and use a lot stronger adhesive tape and copious amounts of white gooey adhesives running along the perimeter of the phone and in other places. The speaker grilles have ingress protection to keep the internals nice and dry, as does the SIM tray, the side buttons and so forth. 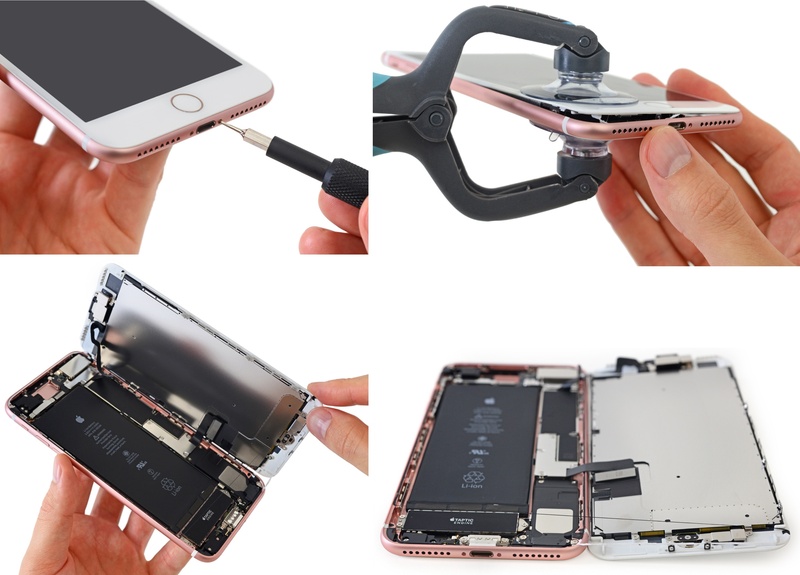 The Lightning connector assembly “is huge” and features the most substantial gasketing iFixit has seen on a Lightning connector. 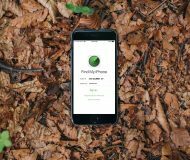 As for the iPhone 7’s non-moving Home button, it’s fully replaceable and works in conjunction with the Taptic Engine which interprets the strength of the contact made on the Home button and translates it into spring oscillation, producing a clicking sensation. Because it’s got no mechanical parts, the Home button should be far less prone to failure and it certainly helps with water resistance. 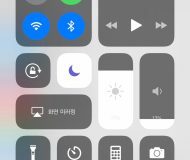 Apple claims the battery in the iPhone 7 Plus lasts one hour longer than that in the iPhone 6s Plus. 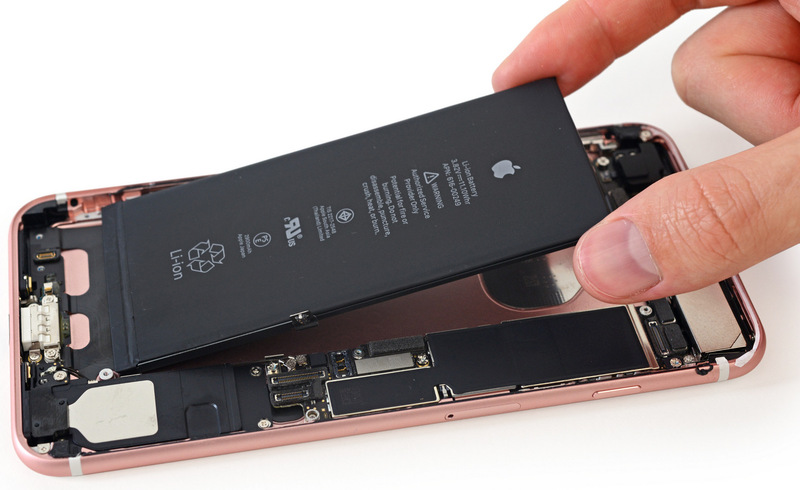 iFixit has confirmed that the iPhone 7 Plus’s battery is rated at 3.82 V and 11.1 Wh of energy, for a total of 2,900 mAh. That’s a slight but notable upgrade over the 2,750 mAh (3.8 V, 10.45 Wh) package inside the iPhone 6s Plus, but still a step down from a 2,915 mAh (11.1 Wh) cell found in the iPhone 6 Plus. 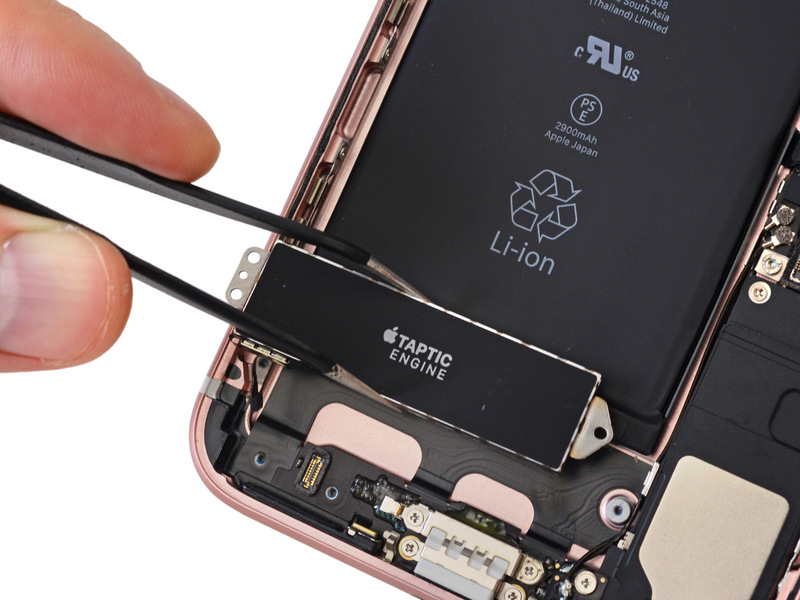 “We’re glad to see Apple sticking with the tradition of including pull tabs for the battery adhesive,“ reads the iFixit analysis of the iPhone 7 Plus. The backside camera system is comprised of a pair of separate 12MP sensors and two lenses, all housed inside the bigger camera bump. One of the lenses is a telephoto lens without optical image stabilization that enables 2x optical zoom, up to 10x sharper-than-usual digital zoom and bokeh effects in a new Portrait shooting mode (coming soon via a software update). 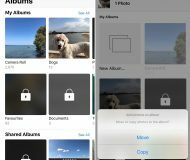 Apple claims a new image sensor found in bot cameras is 60 percent faster and 30 percent more energy efficient than previous iPhones. 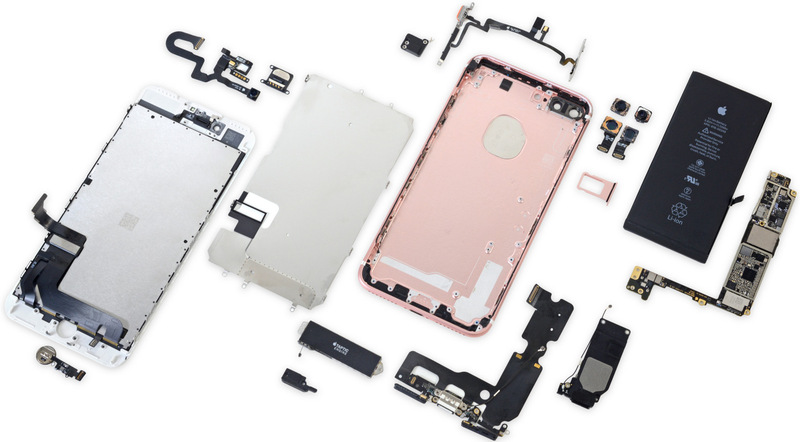 Plucking the logic board from the iPhone 7 Plus is much easier than with its predecessor as there’s no need to flip over the logic board to remove the final connections. 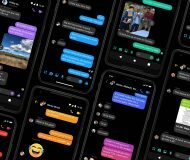 The logic board itself contains fewer chips than the previous models, including Apple’s in-house designed A10 Fusion chip with Samsung-built 3 GB of LPDDR4 RAM (the iPhone 7 has 2 GB of RAM), Qualcomm’s MDM9645M LTE Cat. 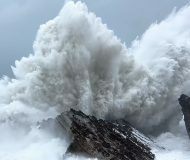 12 modem (AT&T and T-Mobile swaps Qualcomm model for an Intel), Toshiba-built NAND flash, Murata’s 339S00199 Wi-Fi/Bluetooth Module, Apple/Cirrus Logic audio codec and more. 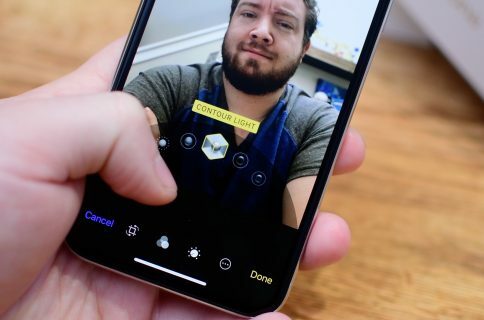 The new iPhones are powered by Apple’s A10 Fusion chip with an embedded M10 motion coprocessor, have a seven-megapixel shooter out the front and a completely new 12-megapixel sensor out the back with optical image stabilization on both models and a second telephoto lens without optical image stabilization in the Plus model. Wrapping up and signing off, both phones still use the same old TFT LCD IPS Retina screens with resolutions unchanged from the iPhone 6/6s series. 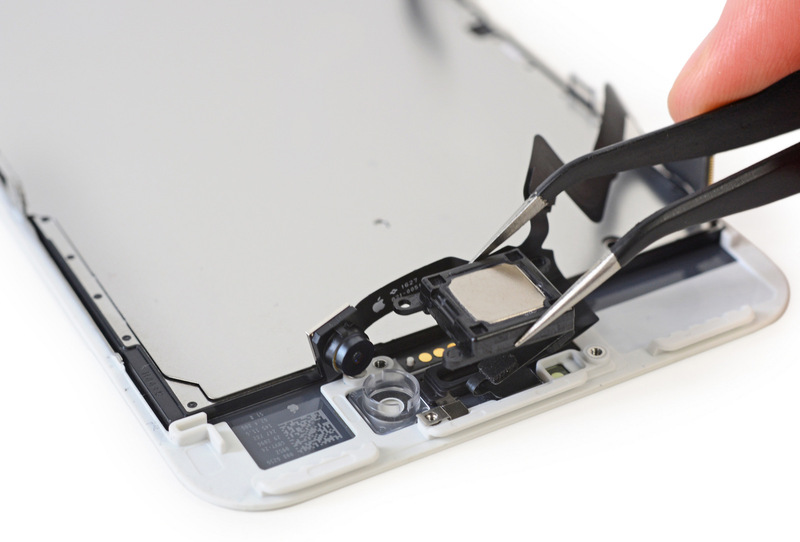 All told, iFixit gave the iPhone 7 Plus a repairability score of 7 out of 10 due to the all-digital Home button eliminating a common point of failure, the battery which is is straightforward to access and improved water and dust protection reducing the need for repairs associated with environmental damage and accidental spills.